President Vladimir Putin on Thursday accused the United States of raising the risk of nuclear war by threatening to spurn a key arms control treaty and refusing to hold talks about another pact that expires soon. 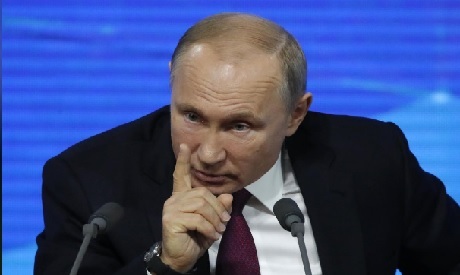 In a news conference that lasted more than three hours, Putin also backed US President Donald Trump’s decision to pull troops out of Syria, said British Prime Minister Theresa May had no choice but to implement Brexit and that Western democracy was under serious strain. Putin has previously said that Russia would be forced to train its own missiles on any European countries that host US rockets. Another US-Russia treaty, the New START pact, which limits the number of deployed strategic nuclear warheads each side can have, expires in 2021. Putin said he was worried that Washington didn’t appear to be interested in discussing its future. The Russian leader, who said Moscow had developed nuclear weapons which he believed gave it an edge over other countries, warned the threat of a nuclear conflict was growing as a result of the US moves. He also cited the dangerous tendency of lowering the threshold for using nuclear weapons and the idea of using ballistic missiles with conventional warheads.